The Cackling Hen: Tupelo: Not Spanish for "Your Hair"
As we travel weekly to a new city with Hens on Ice, I try to assimilate into the local culture. Last year's tour through Europe was a challenge in some ways, but easy in others. 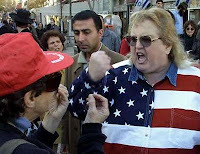 I avoided flashy clothes or anything with an American flag to blend in on the streets, and with my WASPy complexion, some locals even thought I was from there...until I opened my mouth. When I opened my mouth, no matter what country and what language they spoke, I was done assimilating. My accent was like an American flag sweater I couldn't take off. I first thought this year's tour through much of the U.S. would be far easier to blend. I live in this country - consider me assimilated! I've had twenty...something years to learn and live. No menus in foreign languages or women asking me for directions in French this time. While Florida was easy since I live there, many of these southern cities have been worlds of their own. My parents never took me to the south to assimilate. "I'm glad we promoted on Twitter." 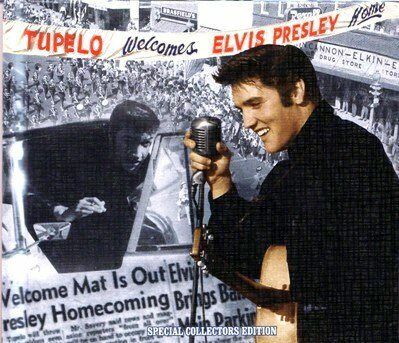 This week, the show has taken us to Tupelo, Mississippi. This small, southern town is the birthplace of Elvis Presley and the birthplace of Elvis Presley. Only Tupelo could make France seem less foreign. At least I didn't expect to understand much French. Where's the translation dictionary for small town southern drawl and slang? I'm only understanding 30% of the words coming from cab drivers and gas station clerks. Lord only knows to what I'm smiling and nodding. Although I don't understand a word out of some locals, at least they've been extremely friendly, especially the local post office worker. My hen friend, Dora, and I strolled to the downtown post office. In line, we hadn't even reached the counter before the worker hollered, "There's the Olympic figure skaters!" Dora and I looked at each other and then down at our clothes. Sure, I had a red, white and blue scarf, but that should blend in okay in this red state. Dora's brown coat didn't scream "Olympic figure skater" either. He chatted with us as he sorted our mail, asking what countries we are from. After Dora gave her exotic answer of Hungary, I had to reply with "just the U.S....Florida." Mr. Post Office immediately said he recognized my accent. I smiled and stared blankly at him, racking my brain about what a Florida accent would be and how I would have it. That was the first time in my twenty...something speaking years on this earth I've been told about an accent. And I didn't grow up in Florida or learn to speak there, so how did I get this so-called accent? You tell me. And mail my postcards, please! "Dammit, we're dressed like Olympic figure skaters again." As I've stepped out to the streets and parking lots of Tupelo this week, my outfits don't really match much of anyone. It doesn't help that people don't walk in the South, so I'm the only one walking as car drivers shake their fists at me. I haven't learned what typical Tupelo dress is, but I do know it's not in either of my suitcases. Here's hoping for better luck in Toronto.